The fleet has been split up. This page covers cars assigned to the Norfolk Southern. If there is one in your area please take a picture, write down the number and e-mail it to Tom at wolfs@netrax.net. If you don't have access to a scanner send the photo to me, I'll scan it and return it. Sightings are listed from most recent to oldest. Pre-split sightings and sightings more than a year old are on separate pages. is a link to a photograph. N-21 21203 Robert G. Sherwood November 11, '99 In bright red paint with full CR markings at Allentown, PA.
N-21 21280 George Alberti November 10, '99 In bright red paint with full CR markings at Conway. N-21 21252 Chris Marks October 30, '99 Sunbury, PA at Northumberland Yard, recently repainted in standard 'can opener' scheme. N-10 24039 Ian Smith October 7, '99 Botsford Yard in Kalamazoo, MI on the now-NS for well over a year. In excellent shape. N-21 21261 George Pitz October 7, '99 At Chysler yard, Newark DE, been there for some time. N-21 21299 George Pitz October 7, '99 At Bay View yard, Baltimore, MD. N-21 21206 JD 'Tuch' Santucci September 14, '99 Looking forlorn and somewhat worse for wear at east end of yard. Colehour Yard is on the Hammond, IN/Chicago, IL border. N-21 21216 JD 'Tuch' Santucci September 14, '99 At Colehour Yard on the Hammond, IN/Chicago, IL border. N-12 24532 Lon Godshall August, '99 In fresh paint, seen in Hershey, PA with Mr. Conrail, Bob Waller. N-10 24040 Lon Godshall August, '99 Seen in Chapmans Yard, C&F branch, Fogelsvile, PA.
N-21 21248 Lon Godshall August, '99 Seen at Allentown TV yard. N-21 21222 Lon Godshall July, '99 Conrail "Q" scheme, seen on local at Pottstown, PA.
N-6A 18065 J.D. 'Tuch' Santucci July 26, '99 At Schererville, IN, seen with 18136 listed below, Both look like they haven't moved in sometime and are also getting pretty ragged looking. The job that works out of here, WDHA-1 usually doesn't use one anymore. This yard is located just off Kennedy Ave, about a mile or so south of Main Street in Schererville, IN near the site of the now gone Hartsdale Tower. N-6A 18136 J.D. 'Tuch' Santucci July 26, '99 At Schererville, IN. 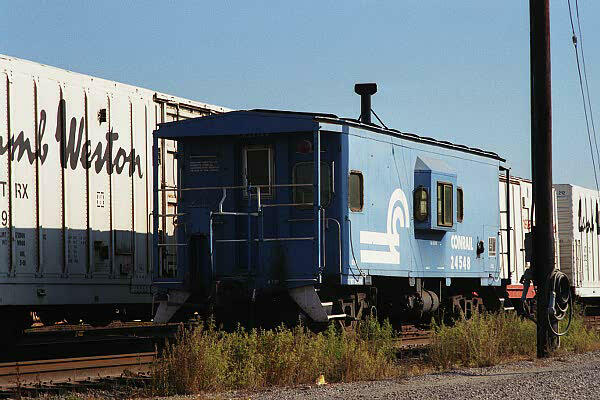 This looks to have been one of the Burns Harbor assigned cabooses as it has the headlights on one end and the jumper cable connections. N-11 18136 Ian Smith July 21, 1999 This former Hughart Yard waycar arrived in Jackson, MI on 'NS' train WDJA01 7/21/99. Evidently it is now in Lansing, MI. It is in relatively decent shape. N-21 21263 Bill Foust July 8, '99 Used on the local runs to Orrville, Ohio on the Pennsy main. Assigned to the Oak Street yard. More info. N-12 24548 Ralph B. Carter June 12, '99 Former Conrail Yard in Walcott Square in the Readville section of Boston,MA. Seen again on June 20, 1999. N-9 18236 Tim Frederick June 6, '99 At Moraine, OH.